Washington apples are known around the nation and around the world, but to those of us who live in Washington State, apples are just a staple. They might grow in any backyard garden, but go to any local grocery store and you will see easily five apple varieties. If apple season is on, there can be 10 or more varieties lined up. Washington’s apple season starts in mid-August and goes well into the fall, but you'll find no shortage of apples any time of year (just the prices are usually higher in off seasons). Each year, more than 100 million apple boxes are harvested and each box weighs about 40 pounds, according to BestApples.com. Most impressive, perhaps, is the fact that there is no harvesting machine designed to pick apples. Each and every Washington apple you buy has been picked by hand. Red Delicious is Washington’s most exported apple—close to 50 percent of what goes out to other countries are Red Delicious apples! About 30 percent of the total apple crop in Washington are Red Delicious, too. This is one of the oldest apple varieties: it was first grown in the 1880s and, as such, it has been modified from its original appealingly sweet and crunchy apple over time. In the past, Red Delicious made up three-quarters of Washington’s apple crop, but since the 1980s, the numbers have been in decline as Red Delicious has started to lose its appeal and signature taste. The skin on this apple is also thicker and stronger tasting than on many other apple varieties. In its place, other apples like Fujis and Galas are climbing up the ranks! Best Use: Eaten fresh or used in salads. While this apple shares a similar moniker with Red Delicious, the two apples couldn’t be more different. Golden Delicious was born in West Virginia in 1914 and remains the state fruit there. Eastern Washington’s dry, warm climate has done well for these apples. Sweet and crisp, easy to grow, and extremely versatile whether eaten fresh or used for cooking, Golden Delicious is the ultimate all-around apple, though, the cultivar rarely gets the accolades it deserves. Best Use: Very versatile. Eat fresh, great baking apple, great in salads. Galas are known for being crisp and sweet, yet mild. They’re a favorite of kids since the skin is thinner and the flavor is light and inviting. Gala apples were developed in 1965 in New Zealand, but are now one of the most common crops in Washington. Best Use: Eat fresh, salads, and a fair apple for baking. Available: September to May, but often all year due to cold storage. 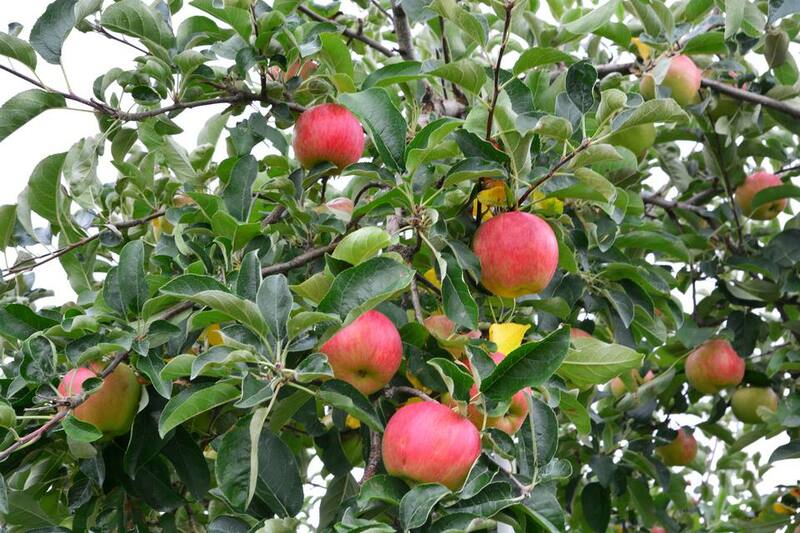 Fuji apples were born in Japan, a cross between Red Delicious and Ralls Janet, in the 1960s. Today, Washington produces more Fuji apples than Japan and this apple is fast becoming one of the favorite cultivars. Fujis are exceptionally crisp, sweet but not overpoweringly so and firm—producing a satisfying crunch when you bite into one. Best Use: Eat fresh or use in salads, can be used in pies, sauces, and baked goods, but Fuji’s real strength is anything that serves it up raw. Available: October to August, but often all year due to cold storage. Granny Smith apples originated in Australia when Maria Smith found a mysterious seedling in 1868, but the seedling’s parentage is still only theoretical (most likely, a combination with a French crab apple). Today, Granny Smith apples are one of Washington’s most popular cultivars and are used for just about everything. The flavor of these apples is tart and assertive and the apples are very crisp and firm. Best Use: Very versatile. Tart and crisp when eaten fresh or used in salads, turns sweet when baked, and freezes well, too. Available: Harvested starting in October, but often available all year. Braeburns are some of the best baking apples due to their mildly tart flavor but are also a tasty apple when eaten fresh. They are said to have a spicy sweetness and a nice crispness, but not as crisp or firm as the Fuji or Granny Smith. Best Use: Braeburns have a fair range of uses and are great for baking and eating fresh. Developed by the University of Minnesota’s apple breeding program, the Honeycrisp is a hybrid known for an amazing balance of crispness, juicy sweetness, and just a hint of tartness. As a result, Honeycrisp is a superb apple for eating raw, much like the Fuji. Available: Harvested in early to mid-autumn. Honeycrisps are not always easy to find in stores out of season. Cripps Pink is also called the Pink Lady and is the last apple harvested in Washington State each year. This cultivar thrives in hot climates and requires a long time on the tree—about 200 days! Cripps Pinks are crisp and tart. They were cultivated in Australia by crossing Lady Williams apples with Golden Delicious. Best Use: Good for salads and pies, but also a fine apple to eat raw. The Cameo cultivar was discovered right here in Washington as a chance seedling of unknown parentage, and possibly a cross between Red Delicious and Golden Delicious. Cameos are crunchy and sweet. Best Use: Great all around for baking, eating raw, salads, and more.